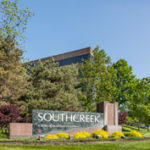 In the month of April, Southcreek is featuring the office of American Bridge Company, a leader in the bridge and heavy/civil construction industry. With roots dating back to the 19th century, American Bridge has constructed a significant number of the world’s largest bridges, marine installations, and other complex structures. American Bridge has constructed a number of notable projects in the Midwestern United States, including the Broadway and Paseo Bridges over the Missouri River in Kansas City, Mo. In the St. Louis area, American Bridge constructed the Jefferson Barracks Bridge and the historic Eads Bridge over the Mississippi River. The Kansas City District of American Bridge is headquartered in Overland Park, Kansas and is led by Scott Gammon, PE, Vice-President of American Bridge Company and General Manager of the Kansas City District. Scott can be reached at 913.948.5800. American Bridge is located in Suite 130 of Building IVa, 7301 West 129th Street, Overland Park, KS 66213.